Home health agencies have been scrambling to prepare for the new Conditions of Participation (CoPs), which hit the industry like a regulatory bombshell in January 2017. To offer Medicare-certified services, agencies must meet the requirements outlined in the CoPs, which had not been updated in 30 years. Not meeting these standards puts agencies at risk, from fines and sanctions to even losing their Medicare certification status. And the cost is expected to be significant — about $324 million to the industry in the first year, CMS estimates. The new CoPs will be effective on January 13, 2018, with some requirements coming into effect six months later. Agencies must comply with an expanded patient bill of rights that is required to be accessible and clear to both patients and staff, and agencies must require that their patients identify potential family members who are involved in a patient’s care. This CoP, requires agencies to provide more prescriptive information within specific timelines to the patient and patient’s legal representative (if any). In an effort to boost quality of care, CMS has included a care planning and care coordination condition of participation. This requires that each patient receive an individualized written plan of care (POC), with personalized services and measurable outcomes that agencies can monitor. The plan of care now must be a ‘living document’ that includes a variety of information, such as risks for hospitalization and verbal orders. There also are new requirements regarding revisions to the POC. 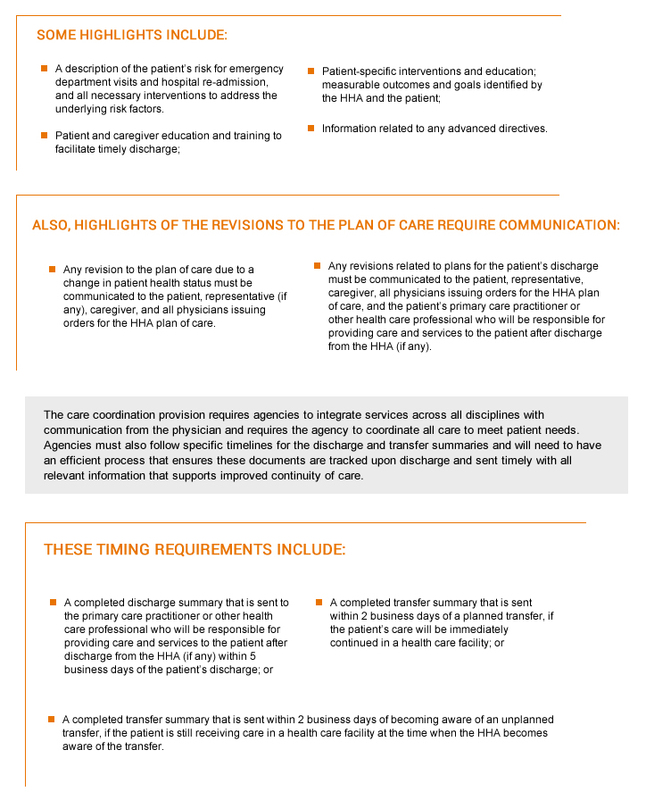 The care coordination provision requires agencies to integrate services across all disciplines with communication from the physician and requires the agency to coordinate all care to meet patient needs. The clinical record provision requires that agencies must also follow specific timelines for the discharge and transfer summaries and will need to have an efficient process that ensures these documents are tracked upon discharge and sent timely with all relevant information that supports improved continuity of care. A brand-new requirement in the CoPs is the Quality Assessment and Performance Improvement (QAPI) provision, which mandates that home health agencies collect more data and undertake performance improvement projects. As this will likely require some agencies without current QAPI systems in place to invest in new technology, this specific provision has a later implementation date of July 13, 2018. Agencies that are part of a larger health system will also have to individualize the QAPI program to the home health agency. Fortunately, agencies have options when it comes to choosing what areas they wish to focus on. However, the program must show measurable improvement in patient outcomes, safety and care quality indicators. Along with new requirements that dictate certain transfer procedures between care providers and settings and require overall better coordination, the CoPs outline a new role. With all the new care coordination and documentation requirements, agencies will need a clinical manager. It’s likely some agencies already have a position that can be designated as the clinical manager, but others will need to hire someone to meet the requirements of this role. The CoPs have already been delayed once. CMS originally intended for most of the new requirements to go into effect on July 13, 2017, but the agency announced in early July it was pushing back the implementation date to January 2018. The home health industry likely had a big role in this decision, as CMS received numerous delay requests from agencies and associations. However, agencies are still eagerly waiting for the interpretive guidance from CMS for the CoPs. CMS has stated the guidance won’t be finalized until December 2017, giving providers a small window to ensure they are compliant with the new rules. While the National Association for Home Care & Hospice (NAHC) argues the CoPs should be delayed another six months after the interpretive guidelines are released, agencies shouldn’t bet that this will happen: CMS has indicated that the release of interpretive guidelines would not require a further delay of the effective date. So, there is no time to waste.